In this fifth investigation, Lord Amerotke, Pharaoh Queen Hatusu’s Chief Judge, tracks down an obscure sect known as the Sebaus who are plundering the royal tombs. Lord Amerotke (The Slayers of Seth, 2002, etc.) has managed to capture most of the network of thieves who have been plundering tombs. He knows that the shadowy leader of the ring must be a person of high rank who knows the secrets of the tombs and can sell the treasures in foreign lands. Immediately after the trial, Amerotke, narrowly escaping death at the hands of paid assassins, is called to investigate the death of Suten, a retired general killed by horned vipers. Although Suten may have released the snakes to confront his fear of them, his wife Lupherna, his scribe Menna and his valet Heby are all likely suspects. 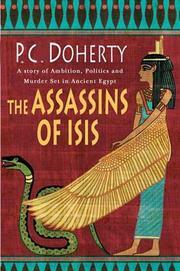 The judge must also visit the Temple of Isis, where four young women have vanished. There, the arrogant captain of the Temple Guard is murdered, and Amerotke is again attacked. With his dwarf manservant Shufoy by his side, he visits desert outposts, homes of the wealthy and hovels of the poor before he realizes that all his cases are related. Amerotke stages a Christie-like confrontation with the suspects and provokes a confession. A great deal of historical information on ancient Egypt compounds the enjoyment of a clever mystery ably solved by the intriguing Amerotke.